Egyptian officials and tourists celebrated the alignment of the sun on King Ramses II's face, a phenomenon that occurs twice a year, marking key dates in the pharaoh's life. The first alignment takes place this year on February 22, marking his assumption to the throne, and the second on October 22, marking his birthday. Folk artists and performers were present on Saturday to help with the celebrations, which included singing and dancing. 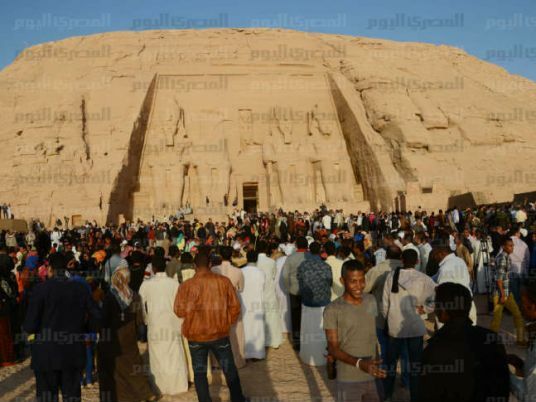 Antiquities Minister Khaled al-Anani attended the event at Abu Simbel temple at Aswan on Saturday morning, along with Moushira Khattab, Egypt’s nominee for the next UNESCO director-general. Anani explained the sun-alignment phenomomen, saying that the sun's rays penetrate the halls of the Abu Simbel Temple and illuminate the head of a Ramses II statue, 60 meters within the building. The Ramses statue is surrounded by others of Ptah, Amun-Ra, and Ra Harakhte. Anani said the 3,300-year-old phenomenon is unique, embodying the scientific progress made by ancient Egyptians, particularly in the fields of astrology, sculpture, engineering and planning, as demonstrated by the buildings they erected everywhere.